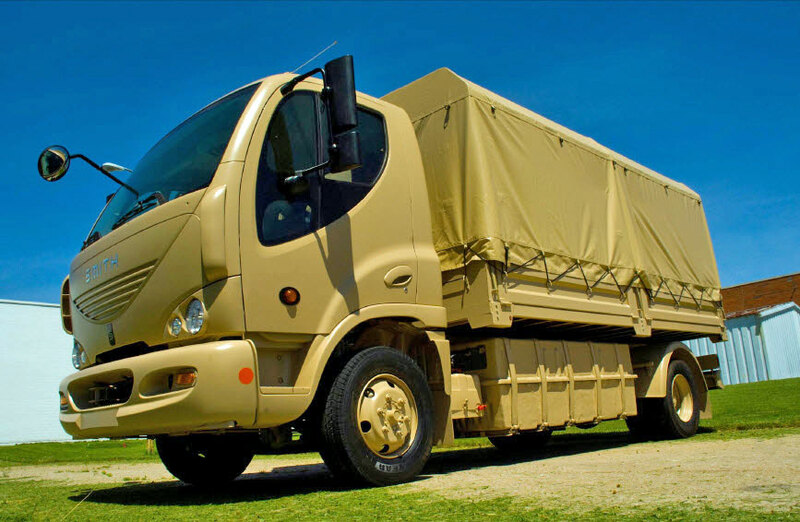 Smith Electric Vehicles US Corporation has sold two all-electric Smith Newton trucks to the United States Marine Corps (USMC). The USMC becomes the first military organization to order Smith Newtons through the Government Services Administration (GSA) schedule; a list of approved suppliers to Federal government agencies. Smith Electric will deliver the trucks to Camp Pendleton, Calif., the Corps’ largest West Coast training facility, and home of the First Marine Expeditionary Force. A September report by the Center for a New American Security recommended in the interest of financial and security concerns that America’s armed forces set a goal of operating all of its systems on non-petroleum fuels by 2040. The Marine Corps has already set out to reduce it energy use 30% by 2015 and increase its reliance on renewable electrical energy to 25% by 2025. The Newton delivers a top speed of 55 mph (88 km/h) and offers end users battery ranges from 50 to 120 miles (80km-192km) on a single charge, ideal for urban deliveries, utilities and personnel transport applications. 75 mph at a 300 mile range and you've got something that I could use as an all purpose pick up. I know it's coming but the anticipation is a killer. In ten years will all look back and say: I remember when electric cars would only go 100 miles on a charge.